A research buoy used for monitoring ocean climate conditions in the sea close to a Greenland glacier has been found washed up on a Highlands beach. The buoy, moored 1,000m (3,281ft) down, last transmitted in 2015 and was thought to be lost after unsuccessful efforts to retrieve it. 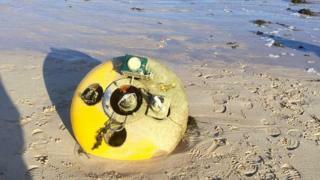 On 9 February, the yellow buoy was found washed up next to Clachtoll Beach Campsite in Sutherland. Scientists said it had travelled 1,098 miles (1,768km). It was found with a Greenland sea anemone still attached to it. More details about the buoy have recently been discovered after the owners of the campsite contacted the manufacturers of the device. It had been deployed in the sea off Greenland by the University of New York. The device is among a number that are regularly deployed and then retrieved by scientists gathering data on ocean climate conditions near the Helheim Glacier. The glacier is the fastest flowing glacier along the eastern edge of the Greenland Ice Sheet, and one of the island's largest ocean-terminating rivers of ice, according to Nasa, another organisation that monitors the glacier. Helheim Glacier is named after the Vikings' world of the dead. After the buoy's last transmission in 2015, scientists chartered a boat to go out and retrieve it. But the mission was aborted after the boat sank. Other attempts were made to collect the buoy, but it was thought lost. This week, the University of New York - delighted the lost buoy had been found and impressed by the distance it had travelled - sent out special cases to Clachtoll Beach Campsite, near Lochinver, for the buoy and its instruments to be returned to them. The discovery at Clachtoll comes a year after a "message in a bottle" scientific experiment reached a Scottish island 12 months after it was dropped into the sea in Iceland. That device, which was fitted with a GPS tracker, was released from a helicopter off the south coast of Iceland. It floated west and passed the coast of Greenland, then headed towards Canada before crossing east across the North Atlantic. The device was found on Tiree in the Inner Hebrides in January last year. Its journeys could be tracked on a website set up by an Icelandic TV science programme which was available to the public. The experiment was designed to highlight to the show's young viewers how rubbish dropped in the sea does not disappear but becomes a problem for people living on coastlines in other parts of the world.